There are performances by NAMVULA who creates a multi-facetted music, SEKOU KEITA joins forces with guitarist ANTONIO FORCIONE and percussionist ADRIANO ADEWALE, new band LOKITO YA CONGO makes their debut with dance music of the highest order. The incredible EZZA brings their Touareg groove to the Vortex Jazz Club and guitarist FEMI TEMOWO and his 10-piece orchestra close the festival performing music from his brand new CD. 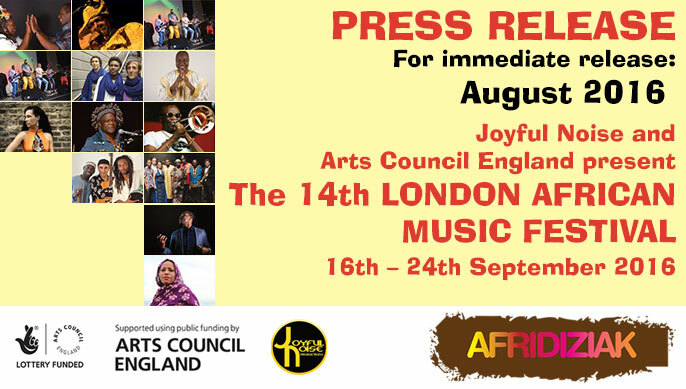 Press information: interviews with the festival founder Biyi Adepegba, artists, press ticket requests and images, please contact Sophia A Jackson: sophia@afridiziak.com / 07855 86 77 78.